What Are the 4 C's of 21st Century Skills? The four C’s of 21st Century skills are some of the most popular learning strategies in today’s environment. You may find some variation on the wording for these skills, but they all encapsulate the same ideas. On a larger scale, these four qualities are essential for modern students to succeed in school and the workplace. The four C’s are all the rage right now. To keep them at the front of your students’ minds, you can keep this graphic at the front of your class! This is only the beginning, though. What does each of these skills actually entail? Critical thinking is the practice of solving problems, among other qualities. In addition to working through problems, solving puzzles, and similar activities, critical thinking also includes an element of skepticism. This is important in the 21st Century because it’s harder than ever to verify accurate information (mostly thanks to the Internet). Critical thinking empowers students to discover the truth in assertions, especially when it comes to separating fact from opinion. With critical thinking, students don’t just learn a set of facts or figures. Instead, they learn how to discover the facts and figures for themselves. They ask questions. They become engaged in the world around them. They help others think critically, too. That might be the most important part of critical thinking. Once one student has it mastered, it quickly spreads to their peers. Whether they learn how to think critically from spending time online or simply asking “Why?” in everyday life, this skill prepares students for a life of independence and purposeful thought. Still, critical thinking is just one of the four C’s in 21st Century skills. It works just fine when students use it alone. But when students combine it with the next skill, the sky is the limit to what they can achieve. Creativity is the practice of thinking outside the box. While creativity is often treated like a you-have-it-or-you-don’t quality, students can learn how to be creative by solving problems, creating systems, or just trying something they haven’t tried before. That doesn’t mean every student will become an artist or a writer. Instead, it means they’ll be able to look at a problem from multiple perspectives — including those that others may not see. Creativity allows students to embrace their inner strengths from big-picture planning to meticulous organization. As a student learns about their creativity, they also learn how to express it in healthy and productive ways. More importantly, they also become motivated to share that creativity with others. Just like with critical thinking, that makes creativity contagious. One student creates an interesting or innovative solution to a problem. Then, when they share it, the next student can become inspired to try something similar. That’s not to say every single creative endeavor will be a ringing success. Students will fail at some point, and some of their ideas simply won’t work. But that’s okay. The point of creativity is to encourage students to think differently than convention demands. They don’t have to do things the way they’ve always been done. Instead, they can figure out a better way. Students don’t have to embrace their creativity alone, either. In fact, creativity works best when combined with the next 21st Century skill. Collaboration is the practice of working together to achieve a common goal. Collaboration is important because whether students realize it or not, they’ll probably work with other people for the rest of their lives. Virtually every job requires someone to work with another person at some point, even if it’s for something as simple as what to get for lunch. Practicing collaboration helps students understand how to address a problem, pitch solutions, and decide the best course of action. It’s also helpful for them to learn that other people don’t always have the same ideas that they do. In fact, as students practice collaboration more and more, they’ll learn that they have almost none of the same ideas that others do. This can affect students in one of two ways. First, it could discourage them since nobody seems to agree with them that often. Second, it could embolden them because they realize they’re bringing something unique to every conversation. As a teacher, it’s crucial that you encourage students to look at themselves through that second lens. That way, students learn that they should speak up when they have an idea. They may not be on the money 100% of the time — and some of their peers may have strong, opinionated reactions — but it’ll teach them to speak up when they’re working with others. Communication is the practice of conveying ideas quickly and clearly. Communication is often taken for granted in today’s society. After all, if you say something, that means you conveyed an idea, right? In the age of text-based communications — SMS, emails, social media, etc. — it’s never been more important for students to learn how to convey their thoughts in a way that others can understand them. That’s because text-based communications lack tone, which is critical to understanding the context of someone’s words. Still, even in situations where vocal tone is available, students need to learn how to communicate effectively. That includes minimizing tangents, speaking directly to an idea, and checking other participants to make sure they’re engaged. Reading an audience — even if it’s just two other people in a group discussion — lets students determine whether they should keep expanding on an idea or wrap up their point. Their audience could even be their family at Thanksgiving dinner. The point is that as students practice communication, they become better at efficiently conveying an idea without losing their point “in the weeds,” so to speak. With communication locked down, students can streamline their ideas and make a positive impression on those around them. Still, it’s important to note that communication isn’t enough on its own to help students with 21st Century skills. 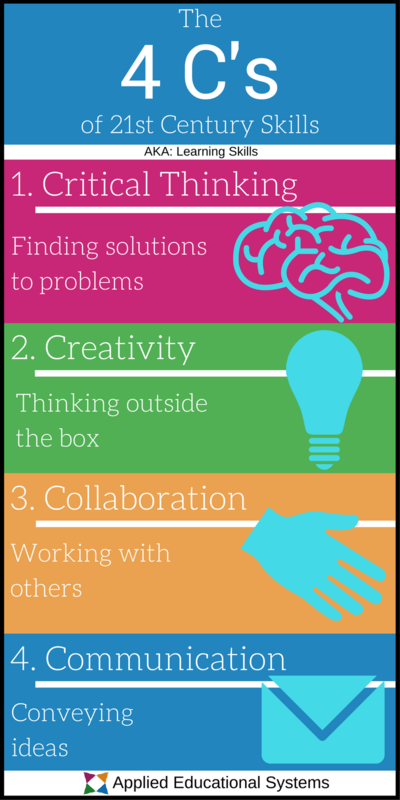 To really succeed, students need to use all four of these skills together. The four C’s of 21st Century skills let students create a whole that’s greater than the sum of its parts. That may sound overly-generalized, and you may be right. But the skills themselves are so general that it’s difficult to pin down what, why, or how students should learn the four C’s. It’s most accurate to say that students need the four C’s for any and every reason. Critical thinking teaches students to question claims and seek truth. Creativity teaches students to think in a way that’s unique to them. Collaboration teaches students that groups can create something bigger and better than you can on your own. Communication teaches students how to efficiently convey ideas. Combined, the four C’s empower students to become one-person think tanks. Then, when those students get together, they can achieve almost anything! Do You Want to Teach the Four C’s of 21st Century Skills? Do you want to teach the four C’s in your class? At AES, we have a digital curriculum system just for you! It features fundamental lessons on 21st Century technology, how to use it, and why it’s important. It also comes with an integrated learning management system (LMS) that automatically tracks grades and lets students work at their own paces. In other words, it’s the best way for students to learn the four C’s! You don’t have to take our word for it though. Check out a free demo of AES digital curriculum for yourself!